Once in a while, there's a challenge doing the rounds which feels as though it was made for me. #ThatsSewGeorge is definitely one of those. 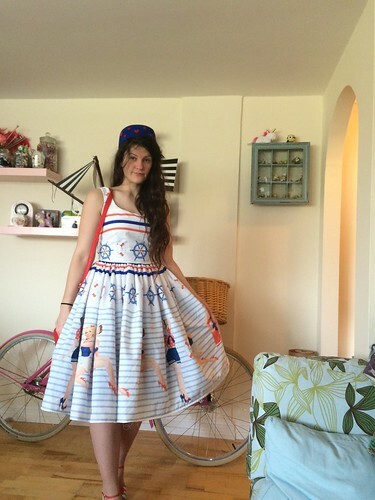 Since I'm already a fan of George's fabulous bedding range, and have had my eye on this set for a while now, it took me no time at all to choose a duvet set to turn into a dress. I've always been a little partial to the nautical trend - it's one of those super fallback trends which comes around like a faithful friend, year after year and every time it does, I embrace it. 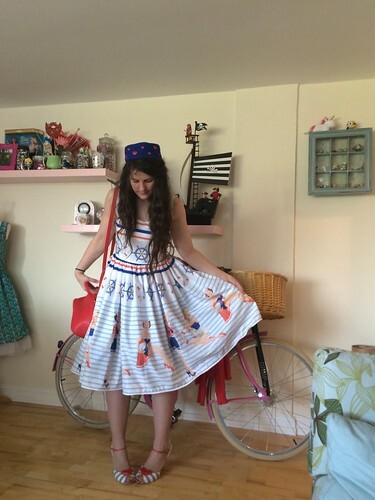 Mixtures of red, white and blue, stripes and anchors are all winners in my book. As are pin ups. So basically, what I'm saying is this duvet set is perfect. I was sent two - one to give my room a little nautical makeover (along with some matching cushions and a cutesy storage box which I'm using for all of those "things" you keep on the bedside table which have no other proper home. Hairgrips, mostly. And with the second duvet set, I made up another of my current favourite pattern - this Bette dress, which was a free pattern with a recent issue of Sew Magazine. (I was sent it by a friend - I didn't break my spending ban!) This is 'upcycling' at it's finest, right? I decided on a gathered skirt, using the full width of the duvet cover and positioned my skirt sections accordingly, to try and make the most of the pattern. I liked the effect of the striped bodice with the anchors and I think this bodice shows off my very best ever pattern-matching to get those stripes running all the way around. The pin-up girl print is quite large, so I kept it to the skirt as I didn't want to lose any of those little cuties to darts. So, when it was all together, I just had to figure out what to wear it with. I decided these heels were the perfect match for the fabric - stripes, hearts, check. 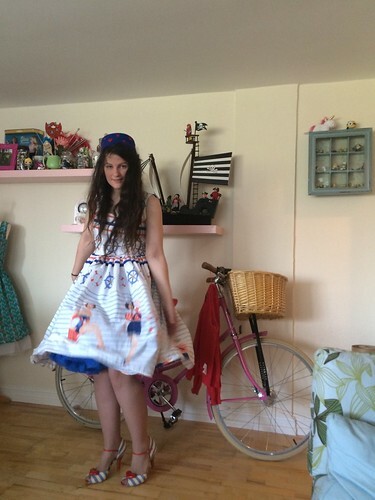 And I carried the heart theme on with this amazing pillbox hat which my friend Emma made. She comes up with some amazing headwear designs. 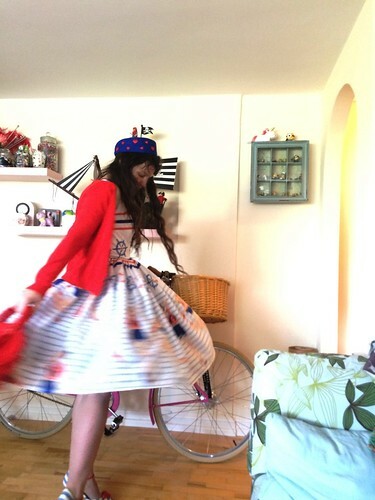 I wore a petticoat under the skirt to show off the fullness, and finished things off with some red touches by way of my cardigan and a fairly plain, red bag. I really like how it's turned out. SO (sew!!) gorgeous, Char!! This is making me so excited to get my finished!! I'm attempting to use the pin up girls on the bodice of mine, using the pillowcases for the bodice and trying to strategically position them so that they won't get chopped up too much by darts. Not sure my pattern matching will be up to much though - we'll see! And I love that your shoes match this so well too, perfect choice. 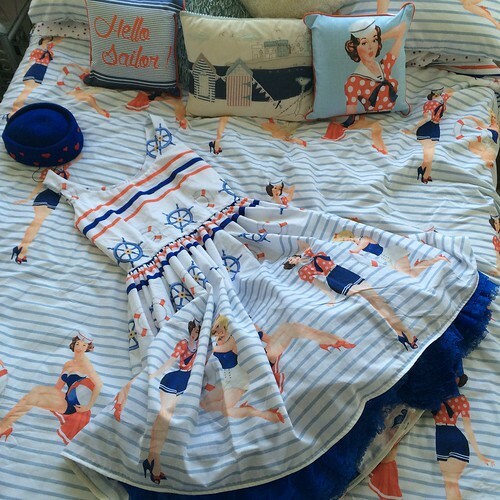 I also have the Hello Sailor cushion :) I bought it a couple of months ago when it first came out as I wanted to theme my new sewing room around it - that may not happen, but I've at least got it to match this set now too! LOVE it! Hadn't realised they had new pin up stuff, might treat myself as I already have the original and the Christmas one (which I bought another of, to make a dress). I love the way you've stuck tot he anchors etc on the bodice, then the girls on the skirt, really makes an impact. Yes, aren't they cute. There are also hula girls, too. Thanks - I took more time than usual over the pattern-matching. I don't tend to mind so much on small, repeated patterns like animals etc. But I'm glad I took the time on this one. This is definitely one of my favourite outfits of yours ever. It all matches so perfectly, and you look fantastic in it! PS- hairgrips do always wind up on the side of the bed don't they. I swear they have their own ecosystem. Oh, I have no idea where all the hairgrips in life go. I wish I knew that! Thank you so much. I've had this beautiful hat sitting around waiting for a chance to shine for a while now, so I was pretty excited to give it an outing! Isn't it cool - I was thinking of the chameleon possibilities. 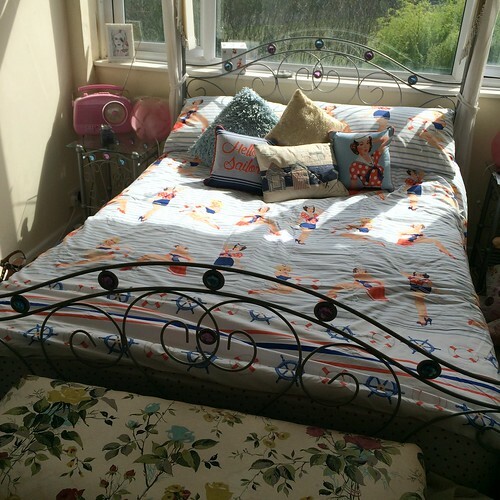 I ordered the hare rabbit duvet (white illustration rabbits on beige) through click & collect I love it! super king size is at least 2 metres. Considering fabric land doesnt sell rabbit print! I have that hare print duvet, which I sort of really love as an actual duvet set, but it's almost tempting to cut it up.